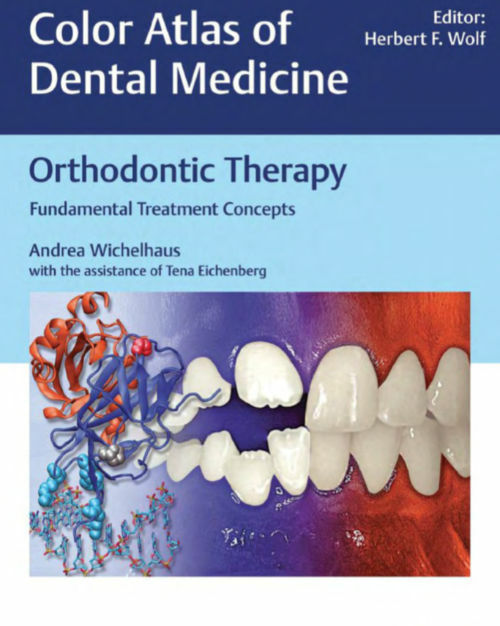 The book of Color atlas fo Dental medicine: Orthodontic therapy Fundamental treatment concepts, Andrea Wichelhaus with the assistance of Tena Eichenberg. Successful orthodontic treatment of anomalies requires a fundamental knowledge of orthodontic tooth movement itself, together with its biomechanical parameters. The kind of tooth movement, intrusion, extrusion, and rotation as well as tipping versus bodily tooth movements must be continuously adjusted to suit the particular patient in terms of the magnitude of force used during the individual treatment phases. Format: PDF, 580 pp., 2018 yr. Orthodontic treatment is a combination of the orthopaedic impact on the bone, or to be more precise, the maxilla and the mandible, and the orthodontic effect on the teeth. The biomechanical response is dependent on factors such as the magnitude of force, direction (force vector), and frequency. Crossbite is part of the group of compression anomalies. A common feature of this anomaly is often the transverse underdevelopment of the jaw. However, crossbite may manifest itself not only in the transverse plane but also in the sagittal plane when it also affects the anterior tooth region. In pronounced cases, cross-bite may also be circular. Crossbite can be treated using various appliances and at different ages. However, the outlay on orthodontic appliances increases with age. The treatment of deep bite can be performed in the late mixed dentition, in the permanent dentition, and in adulthood. Functional orthodontic therapy with bimaxillary appliances and/or two-by-four appliances is of paramount importance when treating young patients, whereas specific orthodontic intrusion mechanics and/or orthognathic surgery is the treatment method adopted for the permanent dentition and during adulthood.